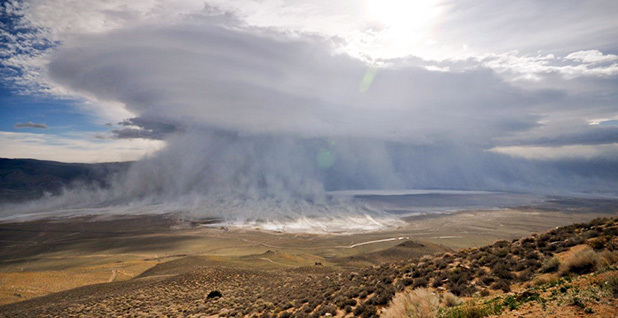 Winds whip dust off the dry 110-square mile Owens Lake bed during a March 2010 storm. The lake, the site of Los Angeles’ infamous water grab at the turn of the 20th century, was home to the country’s worst particle air pollution until extensive control measures were installed. Photo courtesy of Great Basin Unified Air Pollution Control District. INYO COUNTY, Calif. -- America's first water war was fought here in the early 1900s, sparked by a Los Angeles sneak attack on the Owens River. When it ended, the booming metropolis had slurped up the water, Owens Lake was a poisoned salt flat and Owens Valley residents were choking in thick clouds of toxic dust. The Owens Lake story is a cautionary tale for the West, where cities, farms and endangered fish are battling over water supplies threatened by a warming climate and historic drought. There are at least a half-dozen salt lakes -- including Utah's iconic Great Salt Lake -- being strangled by arid conditions and rising demands for fresh water. Greenwire examines water-management blunders that are turning the West’s once-magnificent salt lakes into hotbeds of toxic air pollution. Scientists call the lakes "terminal" because they are found at the end of river systems, but the term could also be a diagnosis. "They are all threatened in one way or another," said David Herbst, a biologist with the University of California's Sierra Nevada Aquatic Research Laboratory. "It's well taken that climate change and drought -- their coupling -- is going to have a large effect. But diversions for agriculture, for urban uses -- that's the reason that water is taken away." What's left after the fresh water vanishes is deadly to people and wildlife. Rivers sweep into the lakes sodium and chloride and farm contaminants -- selenium, pesticides, mercury and arsenic. So when fresh water stops flowing, the existing water evaporates, leaving behind salty plains of toxic dust. For public health, the impacts are severe. Imagine dust bowls where you can't see 20 feet in front of you and need a respirator to breathe. Some of these lakes, like Winnemucca in Nevada and Sevier in Utah, are already gone. Others are in grave danger. The Great Salt Lake is fouling the air near Utah population centers, yet the state is weighing a new diversion project that would reduce freshwater flows, exposing more of its lake bed and likely increasing toxic dust, local experts say. In central Asia, the Aral Sea, which straddles the Kazakhstan and Uzbekistan border, was once one of the world's largest inland water bodies, spanning 26,000 square miles -- roughly the area of Ireland. But it was destroyed by the Soviet Union's diversions to irrigate cotton fields in the 1960s. Image courtesy of NASA Earth Observatory. The Salton Sea, California's largest lake, will see water flows drop dramatically in the next year under a complicated state-backed agreement that transferred water from the farms near the lake to San Diego. Without dust controls, scientists say, a public health catastrophe looms for 600,000 people who live near the lake -- and for people as far away as Los Angeles or Phoenix who might find themselves in poison dust clouds. Even Mono Lake, the focus of a landmark California Supreme Court case and one of the West's most protected lakes, appears headed toward crisis. Michael Rosen of the U.S. Geological Survey said the destruction of the lakes was a blatant disregard of nature. "Once the water gets there, it is no longer useful for humans," Rosen said. "So if we can divert the water before it becomes unusable, that's a beneficial thing. That's the way it was historically looked at." Put another way, allowing water to flow into these lakes has not been considered "reasonable and beneficial," a mandate that appears in the state constitutions in the West. There is no law or clear regulatory framework to protect the lakes. Instead, there are a variety of competing interests, industries, agencies, municipalities and states all vying for their increasingly depleted inflows. By the 1920s, Owens Lake -- which once sprawled over 110 square miles and teemed with wildlife -- had become a dangerous source of air pollution. Winds whipping through the valley at up to 60 miles an hour stirred up dense clouds of cancer-causing dust and salt. 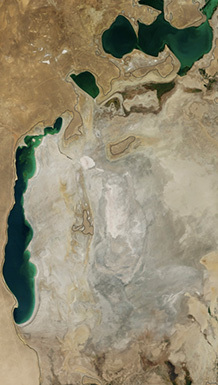 The Aral Sea is now about a tenth of its original size, and one of its basins has completely dried up. Its toxic dust has elevated regional rates of cancer, birth defects and respiratory diseases. Image courtesy of NASA Earth Observatory. Los Angeles has been forced to spend some $2 billion to engineer a dramatic pollution fix deemed by some here one of the great engineering fixes of the 21st century. The hardscrabble project is a patchwork of dust-smothering techniques, including gravel, flooded ponds and rows of planted vegetation that cover nearly 50 square miles -- an area more than twice the size of Manhattan. "I think Owens Lake may someday be the ninth Wonder of the World," said Phillip Kiddoo, the head of the Great Basin Unified Air Pollution Control District, which enforces federal air pollution regulations. "Everyone said it can't be done, it's too big a problem. But we're proving everyone wrong." Owens Lake brings into sharp relief the ramifications of letting lakes go dry. It also underscores what it takes to fix a lake's air pollution problems, and managers from lakes around the world are looking to Owens Lake for solutions. Without greater protections, Herbst said, these lakes are "screwed." Owens Lake, a remnant of a much larger water body that formed during the last ice age, is nestled between the Sierra Nevada and the Inyo Mountains. With peaks reaching more than 14,000 feet, the mountain ranges form the Owens Valley -- 75 miles long and 10 to 20 miles wide. 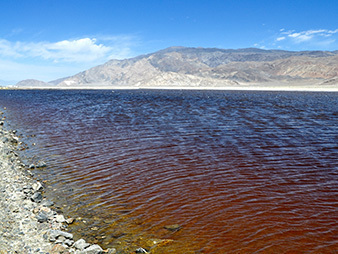 The lake is fed by the Owens River, the only major river east of the Sierra Nevada. The Owens begins near Yosemite in Mono County, then heads south more than 100 miles to the lake. In high-water years, the river carries hundreds of thousands of acre-feet of water. An acre-foot is about 326,000 gallons, or around enough for a family of four for a year in Los Angeles. As the 20th century dawned, the new Los Angeles Department of Water and Power, DWP, led by Chief Engineer William Mulholland discovered the lake. 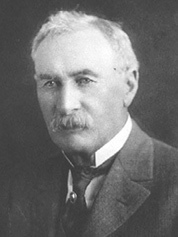 William Mulholland led the Los Angeles Department of Water and Power’s quest into the Owens Valley. Photo courtesy of Wikipedia. Mulholland -- a smart, brash and arrogant Irish immigrant -- had his eyes fixed on using that water to build an empire. By 1904, DWP concluded it lacked enough water to serve a population that was doubling every four years and was gripped by drought. What followed was a plot to pipe the Owens River to Los Angeles -- even though the two were separated by more than 200 miles, a mountain range and a desert. Mulholland would not be deterred. His department used tricks like flushing all the water from Los Angeles reservoirs into the ocean at night in order to make the drought appear more severe and garner support for a bond measure to fund the project. And his agents shielded their identities, posing as farmers looking to buy land. The caper became the basis of Roman Polanski's celebrated 1974 film, "Chinatown," and was described in colorful detail in Marc Reisner's 1986 account of Western water management, "Cadillac Desert." "Los Angeles employed chicanery, subterfuge, spies, bribery, a campaign of divide-and-conquer, and a strategy of lies to get the water it needed," Reisner wrote. "In the end, it mined the valley bone-dry, impoverishing it, while the water made a number of prominent Los Angeleans very, very rich. There are those who would argue that if all of this was legal, then something is the matter with the law." Mulholland's department bought nearly the entire valley -- more than 300,000 acres -- for groundwater and water rights. By 1913, it had captured all the streams of the Owens River. And within a few years, Owens Lake had dried up. The aqueduct and pipeline to transport the water to Los Angeles took six years to build across the Mojave Desert. At 223 miles, including more than 50 miles of tunnels, it was the world's longest aqueduct and the largest single water project on Earth. Owens Valley farmers fought fiercely, using dynamite to blow up large swaths of Mulholland's aqueduct several times in the 1920s. But by the 1930s, DWP owned about 95 percent of the farmland in the valley and 85 percent of town property. And still Los Angeles needed more water. By 1970, a second aqueduct was constructed that the city used to begin pumping groundwater, which further dried up the land and water that fed Owens Lake. "[I]nstead of leading his people through the waters to the promised land, he would cleave the desert and lead the promised waters to them," Reisner wrote. "To a thirsty city, he was Moses." Ted Schade came to Owens Valley to clean up Mulholland's mess. 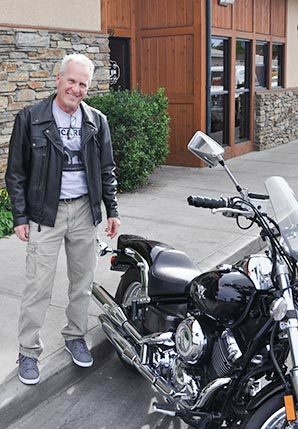 Schade (pronounced "shady"), a 58-year-old civil engineer with short gray hair, blue eyes and a love of motorcycles, grew up in Southern California and frequently camped in the eastern Sierra as a child. Ted Schade fought Los Angeles for nearly 25 years to control the dust pollution as the head of the local air pollution control district. Photo by Jeremy P. Jacobs. After a trip in the Owens Valley with his wife, he picked up a local newspaper with a job ad seeking an engineer to study "fugitive dust." "I thought fugitive dust was the dust that escaped convicts made," Schade joked. The posting was the beginning of the Great Basin Unified Air Pollution Control District's attempt to tackle the nation's worst dust pollution. Since the lake bed dried up in the 1920s, nothing had been done to control salt and other coarse particles that are picked up by the valley's strong winds -- despite numerous complaints from locals suffering from respiratory ailments. The tide began turning in Owens Valley's favor in the late 1970s when the military got involved, Schade said. Just south of Owens Lake, the Naval Air Weapons Station at China Lake is the Navy's largest test facility for missiles and other weapons. Tests there require specialized cameras -- and clear views. So the Navy had grown weary of canceling tests in frequent dust storms. And then Congress acted. In 1987 and 1990, lawmakers amended the Clean Air Act to address dust. The landmark 1990 amendments classified coarse particles as a hazardous air pollutant, specifically citing pollution at Owens Lake. That, Schade said, "gave us our marching orders." The air district prepared a state implementation plan for U.S. EPA that required DWP to control the dust by 2001. DWP refused. The department is a formidable foe -- the nation's largest water and power utility, with 8,800 employees and serving more than 3.9 million people in an area of nearly 470 square miles. It sells $1.1 billion per year in water and another $3.3 billion in electricity. The politically connected and well-heeled department flexed its legal muscle. Schade's first break came because DWP was headed in the late 1990s by S. David Freeman, an engineer who helped establish EPA under President Nixon and led the Tennessee Valley Authority under President Carter and who remains generally held in high regard by the environmental community. Freeman, Schade said, recognized DWP was responsible for the dust that in 1998 -- when EPA ordered the department to control the pollution -- was more than 100 times beyond the federal standard for coarse particulates. So DWP agreed to invest in fixing the lake bed, but Freeman insisted the air district would not order how to do it, or mandate that huge swaths of the lake be cleaned up at once. It was hard to tell how much of the lake was emitting dust, he said, so by installing dust controls piece by piece, DWP could control the dust without having to cover the entire lake bed. From the beginning, the air district believed it would take dust controls on about 45 square miles of the lake bed -- nearly half the lake bottom. But it gave DWP three options for dust control: apply water, gravel or plant vegetation. In 2001, the air district began flooding 10 square miles in the northeast part of the former lake. The effort failed to bring the area into attainment with federal standards, so Schade ordered more gravel coverage. He then ordered more. And still more. In 2011, the last additional requirement was ordered, but DWP balked and drew a line in the dust. "They pulled out all the stops," Schade said. "They sued us on everything they could sue us on." At one point, there were at least a dozen lawsuits flying. How did an air district that operates with a skeleton staff working out of an abandoned motel afford to fight all the lawsuits and public relations assaults, while simultaneously monitoring one of the most complicated air pollution problems in the country? The political pendulum had begun to swing away from DWP and toward the air cleanup. 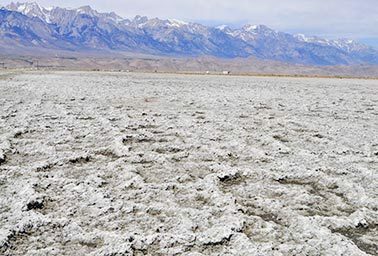 Some areas of Owens Lake are covered by a thick, coral-like salt crust. Photo by Jeremy P. Jacobs. 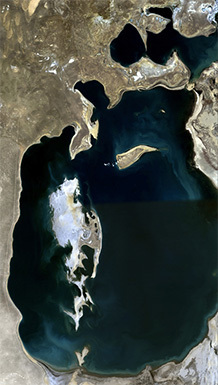 In 1983, the California Legislature passed Senate Bill 270, which forced DWP to pay all "reasonable" costs for mitigating the dust at Owens Lake. The language was part of a compromise in which the air district could not require DWP to put water on the lake, affect its water rights or cut off all water flowing to Los Angeles. As the district took more aggressive steps to tackle pollution -- there are now some 200 air monitors of some sort on the lake -- DWP had to foot the bill. Then, in 1998, a court applied the same principle to attorneys' fees. The air district hired the best environmental lawyers in the state, and a court held that was "reasonable" under S.B. 270 because DWP also had a top-notch legal team. So the water department was forced to fund both sides of its legal war. "We just sent them the bill and they had to pay us," Schade said. In 2013, DWP's will began to crack when Eric Garcetti (D) was elected Los Angeles mayor and Michael Feuer (D) was elected city attorney. Both had strong environmental credentials, and Garcetti appointed commissioners to DWP's board with environmental backgrounds, including former U.S. Rep. Mel Levine (D) and attorney William Funderburk. They all expressed an interest in getting past the contentious litigation. The district reached a settlement with Schade in October 2014 that required dust controls on 48.6 square miles, an area that is largely already in place today. There is also another 10 percent of the area -- 4.8 square miles -- set aside as a contingency that the air district can order and DWP can't dispute. Schade said it appears the 48.6 square miles is going to be enough to bring the lake into Clean Air Act attainment. The dust is more than 90 percent controlled, and DWP will continue to divert large amounts of water to Owens Valley in the future. It is planning to keep 158,400 acre-feet of Owens River water in the valley in the next year, including 65,000 acre-feet specifically for dust mitigation and another 8,000 acre-feet for recreation and wildlife. Those commitments to the valley are locked into law. DWP will likely keep more water in the valley in the next year than it will export to Los Angeles, 114,000 acre-feet -- more than San Francisco uses in a year. During the height of the drought last year, all the water flowing down the aqueduct at one point was diverted to Owens Lake; none went on to Los Angeles. Schade retired last year after the settlement was put into place. "When the bad guys are vanquished, the sheriff gets on the train and rides out of town," Schade said, half joking. Last November, Schade gathered with DWP and air district officials on the lake bed. They dug a hole and buried legal documents and mementos from the 25-year fight, including, of course, a hatchet. Spend some time at Owens Lake and you'll hear people talk about "unintended consequences." Along with the original dust pollution, there were unexpected problems when DWP in 2001 began flooding miles of the lake bed in response to the air district's first mitigation order. Halobacteria turn the water in one dust control area dark red. Photo by Jeremy P. Jacobs. DWP chose flooding because it was simple and the most cost-effective. It was a matter of building a large earthen berm and turning on the water, which the department already owned. Almost immediately, the birds that had abandoned Owens Lake when it dried up returned. Because the lake bed itself is state-owned and protected by California's public trust laws for wildlife, DWP was required to safeguard birds landing in an enormous construction zone. Some of the birds were rare species, like the snowy plover. "We've created all this habitat, and it was completely inadvertent," said Jeff Nordin, a DWP watershed resources supervisor, on a recent lake tour. "It was, 'Let's control dust the quickest and easiest way. Let's put water out there.'" Nordin, 36, grew up in the Los Angeles area and now leads DWP's mitigation efforts from a biological and ecological perspective. The Audubon Society also swooped in and began working with Nordin to create a master plan for how to turn the lake's mitigation tracts -- called "cells" or "dust control areas" -- into habitat for a variety of bird species. "We didn't want this place to be paved over," Audubon's Andrea Jones said. The process could take another 10 years, and DWP may spend another billion dollars on it. The goals are to conserve water, maintain dust control and build bird habitat. That includes increasing public access to the lake for bird-watchers and making the lake more visually appealing. To that end, last month DWP unveiled a series of trails sought to entice visitors and, in particular, birders. The main attraction is a gazebo-type kiosk with wings reminiscent of a snowy plover's and landscape architecture meant to evoke the white caps of waves. It can be reached by turning off the highway visitors would traverse driving from Death Valley to Yosemite. DWP spent $4.6 million on the project. Nordin said the goal is to gradually convert the dust control areas that don't provide good habitat into ones that attract birds. That includes varied ponds with islands and other vegetation. Herbst, the University of California biologist, said the new plan provides an interesting opportunity. Because of the control DWP has over these different cells -- their shape, salinity level, depth, etc. -- it can create a "mosaic of different habitats," he said. "All these different types of habitats for all different kinds of birds." That can include deepwater ponds for some bird species, as well as shallow ponds for others that are ideal for growing the algae at the bottom of the ecosystem's food chain. Herbst said he is skeptical that DWP can accomplish these goals while still cutting back on water use, as it plans to do, but the potential is there to create an important foraging ground for a wide variety of birds. "It will just draw in birds because of the food if the salinity is at the right level," Herbst said. But controversies aren't over. The Paiute tribe, whose reservation is just north of the lake, is critical of the trails and mitigation projects along the shoreline that are near ancient burial sites and other cultural artifacts. Kathy Bancroft, 61, a Paiute community leader who has suffered breathing problems her entire life, said she is primarily concerned about preserving their sacred grounds around the lake. She criticized DWP's projects for their "highly engineered" feel. Nothing looks natural or as it looked for her ancestors, she said, and she referred to each dust control area as another "Band-Aid." She said there are more natural ways to control dust. "It's not like you would have to continually fill it up," she said. "You'd fill it up and then the vegetation would start growing on the sides. Then if you gradually drained it down, the vegetation would follow it. Things like that. But nobody thinks like that. They are just putting these Band-Aids on." But DWP's Nordin said he's optimistic that since the settlement in 2014, the local animosity will shrivel. He said the master plan, which will take 10 years to implement, is a new phase for the lake. "There's been a lot of ideas that DWP caused this mess, and there are some punitive aspects to it," Nordin said. "We are trying to get to where we are moving forward with all stakeholders collaboratively to meet all of their goals." 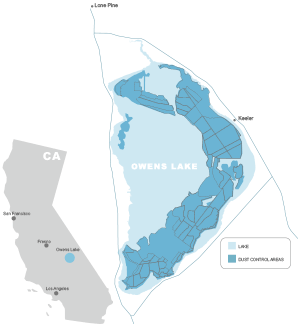 DWP will be working at Owens Lake in perpetuity, managing wildlife habitat and dust controls. Officials overseeing water management in the West are looking to Owens Lake in anticipation of what they'll face in their own areas. Schade, the former air district control officer, however, warns that the Owens Lake cleanup was probably easier than others -- notably, the Salton Sea in Southern California near Palm Desert. More people live near the Salton Sea, which is more than three times the size of Owens Lake -- nearly 350 square miles. The Salton is already shrinking, and the amount of water reaching the lake will slow dramatically in the next year. By some estimates, 26,000 acres of the Salton Sea's lake bed will be exposed by 2020. At this point, there are only 2,000 acres of planned dust-control and habitat projects scheduled to be completed by that year. Schade, who visited the Salton Sea while he was working on Owens Lake, sees trouble ahead. "I took a look at it, and I said, 'Oh, my God.' Looking down at the soil between my feet, it looked exactly like Owens Lake. And I know what happened when Owens Lake disappeared," Schade said. Coming Monday, June 13: What happened to the Salton Sea?